~The grant application was complete, specifically addressing goals and objectives from their curriculum (we use Creative Curriculum). ~There was a clear plan for how the money would be used to enhance the learning and environment in connection with the curriculum goals and objectives. ~The application demonstrated a creative use of funds to maximize the full award. Socially and Emotionally/, preschoolers interact with their peers. 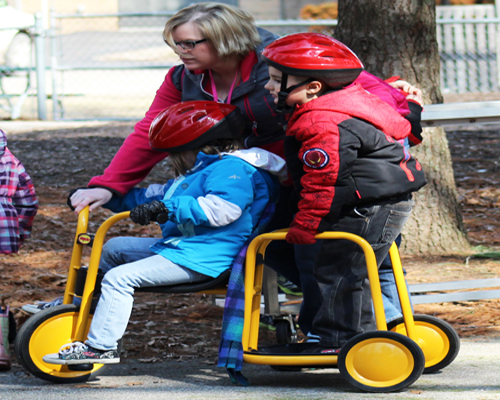 A tandem tricycle could help preschoolers who have difficulty interacting with others by giving them an opportunity to work on cooperating in group situations as they decide who will be next and who will ride together. Working on their traveling and balancing skills would allow preschoolers to build their muscles and burn extra energy so they may be able to work on their cognitive skills in the classroom. Literacy is addressed with a sign-up sheet for the tricycle (often 36 preschoolers on the playground and one tandem…a sign-up sheet is a must!). The students write their name if they are waiting for a turn. Language is also practiced as they discuss who is next and who will ride together. Mathematically they work on understanding spatial relationships as they figure out who is in front, behind or riding beside them. They count on the sign-up sheet to see how many more preschoolers are in line before them. Some of the preschoolers even use Science and Technology as they inquire how the tricycle works resulting in STEM Learning. Who would have thought that a tandem tricycle could help preschoolers learn so many things? WMFC would like to thank the Regional Preschool Partnership for providing our preschoolers with such an amazing tool for learning!